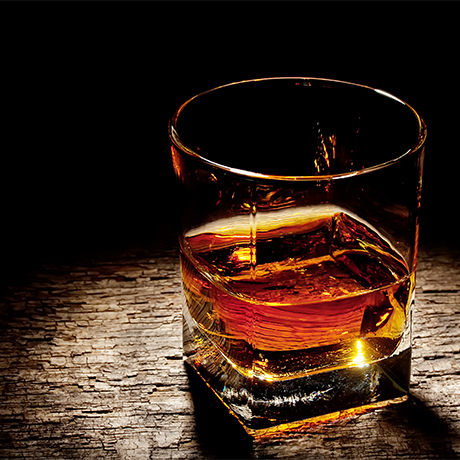 Through a series of mergers and acquisitions, International Distillers & Vintners (IDV) helped form the basis of Diageo, the world’s largest producer of Scotch whisky. IDV’s interests were purely of the beverage kind – though this included Port and wine as well as gin and Scotch whisky. On the Scotch front it owned the J&B blended Scotch brand through subsidiary Justerini & Brooks, as well as the Auchroisk, Knockando, Strathmill and Glen Spey distilleries. It became part of Diageo in 1997 after its owner merged with Guinness. While IDV was established in 1962 by the merger of W&A Gilbey and United Wine Traders Ltd (UWT), the heritage of these two companies gives IDV far greater significance. UWT had brought with it Justerini & Brooks, a wine and spirits producer dating back to the 18th century, whose J&B Rare blended Scotch was already selling over one million cases per year at the time of the merger. W&A Gilbey’s background had been predominantly in gin though it owned the Glen Spey distillery and historic blending house James Catto & Co. In 1972 IDV was sold to Watney Mann, which was acquired itself by hotel and catering corporation Grand Metropolitan just six months later. This integration brought together several historic whisky companies in Scotland, and their distilleries of course. At this point IDV operated four distilleries –Auchroisk, Knockando, Strathmill and Glen Spey – and a string of blenders and agents, including Dunhill Scotch Whisky Sales Ltd, Andrew Laing & Co. Ltd, and Strathspey highland Malt Whisky Co. Ltd. In 1969 extensive warehousing, coopering and blending and bottling facilities were built on a 31-acre site at Blythswood near Renfrew, prompting IDV to break its traditional ties with Aberdeen, which was considered too remote a location for such a large operation. During the 1980s Grand Metropolitan continued to add wine and spirits ventures to its portfolio – such as the American producer and distributor Heublein Inc – but it also continued to expand out into the catering business. In 1988 it acquired Pillsbury food company which added Burger King, Green Giant and Häagen-Dazs to the ranks. In 1997 Grand Metropolitan merged with Guinness PLC to form Diageo (the name was changed from GMG Brands). The new company sought to separate Grand Metropolitan’s food businesses from its beverage operations, and so merged IDV with Guinness’ United Distillers to form Guinness UDV.